This is a line-up of the hottest comedians around, giving you a front-row seat to their best material. 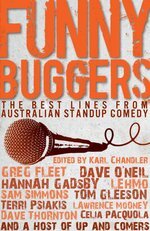 Karl Chandler is a funny bugger and so are his mates. In fact, our local talent has been killing it in clubs and festivals the world over. Lucky for us, these comics have worked around their hectic schedules – setting their alarm clocks for before midday and logging off Twitter – to cough up some of the most pants-wettingly funny stuff you'll read all year. I stopped writing a diary when I read Anne Frank's effort. That genre has been conquered. Television is a very powerful tool. But then again, so is Eddie McGuire. Throw your hands in the air like you just don't care. Unless you're at an auction. The other day I got a big pile of money and burned it. Sorry, I mean I joined a gym. I like to go to the library, get all the books on feng shui out, and put them back in the wrong section. Love Funny Buggers: The Best Lines from Australian Stand-up Comedy? Subscribe to Read More to find out about similar books.